Corner shower enclosure with tempered glass door available in various colors. Glass showers available in numerous sizes for rectangular and square plates and chrome mirror finish accessories. Corner shower 1000-17 with single hinged door with tempered glass available in various colors. The glass door hinged on one side has a magnetic closure which is connected with the fixed side of the shower stall. Accessories such as handles, hinges, arms support and lower profiles are made of aluminum chrome mirror, while the wall vertical profiles are in aluminum in chrome finish. 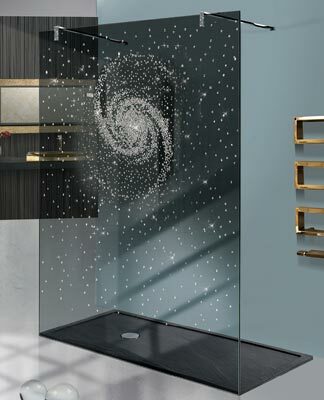 Corner shower cabin with swing door H. 195 cm customizable in the choice of crystals that can be available in: clear glass, frosted glass, tinted glass, glass stop sol and cloud glass (frosted in the middle to become transparent in the upper and lower extremities) .